Live, from Peoria,Illinois, it’s Saturday Night, starring this week’s host, Tavern 41, with special guests, Joanie, Chris Herold, Michelle, Brian, Fletch and Bret! Now please welcome, all the way from Sterling Avenue, Tavern 41! In case you haven’t heard, a slice (pun fully intended) of Peoria’s history has been reborn here on Sterling Avenue. Tavern 41 opened in this spot a few months ago and this is the location of the former Pizza Inn that was taken over by the Aurelio’s chain pizza restaurants back in 2013. Pizza Inn was a family-run pizza parlor that had been in existence here in Peoria since 1967 and had been run by the Herold family the entire time. They closed back in 2013 and I came for the last night and met Chris Herold who was running the place after his parents had retired. Well, Aurelio’s had a four year run and they ended their existence and Chris decided to reinvent this former Pizza Inn location and came back and took the spot over with his nephew, Shawn and longtime manager, Zack Johnson. As you can see by the sign, they are now open, so let’s go in and take a look around! Tonight is National Pizza Day, so this is the perfect night to spend an evening in here! As soon as I stepped in, I ran into Joanie, who’s a waitress here and we last bumped into her at the Chris Kattan show at the Jukebox Comedy Club. She’s looking cute as ever and I love her wonderful smile! It was great to catch up with her and she said business has been booming in here since it re-opened. Co-owner, Zack Johnson was behind the counter and there’s one of the impressive pizza pies he’s made tonight. It looks delicious and I can’t wait to try one! The entrance to the back bar, which is a fun and cozy little late night hide-away here in Peoria! There’s a nice horseshoe bar back here and Fletch is behind the bar serving up an ice-cold 16 ounce can of Pabst Blue Ribbon. As you can see, it’s pretty crowded back here tonight and I see some familiar faces over at the other side of the bar. 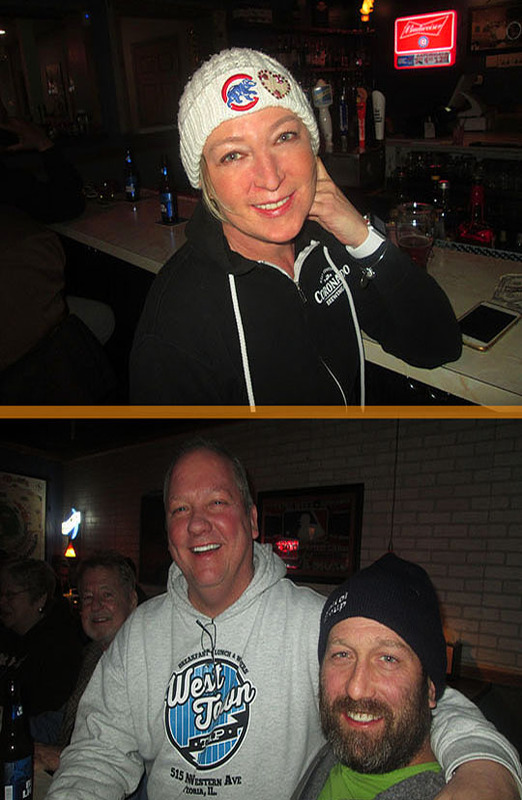 There’s my friend Michelle who’s looking pretty in her stocking cap and then I ran into the owner of the joint, Chris Herold who was at the bar with Brian. Great to see all of them and I reminded Chris that we first met back here in 2013. You can read about that by clicking here. Dining tables line the far wall opposite the bar and the Rogers party was enjoying dinner and a Tavern 41 pizza at their table. I had a nice conversation with them and it was nice to meet this friendly quartet! As you can see there’s a nice selection of beers on tap and nightly specials here in this back bar at Tavern 41. Standing attention above the liquor bottles on the back wall is none other than the original party animal, Spuds MacKenzie! This is a picture of Chris’ father on the wall behind the bar who founded this restaurant and tavern back in 1967. 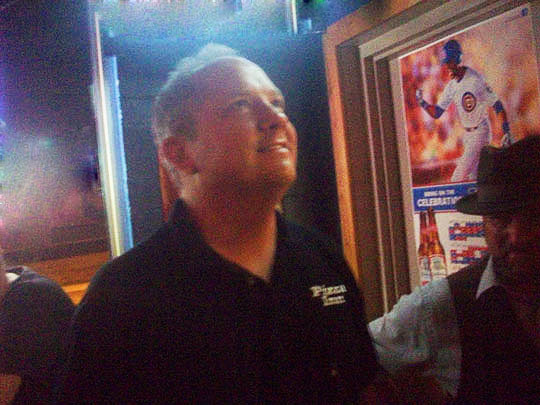 Bret Johnson was at the bar and we last saw him when he was playing with his band, Captain Quirk at Chris Herold’s other tavern in town, The West Town Tap, check that out here. Bret took the MBIP Camera and got a shot of Michelle and I and then I took a photo of a rare moment of love with Michelle and Chris. Moments later they were back at war with each other. That’s the way it goes with these two! A pizza pie is delivered by Jay! I took the advice from this review by Phil Luciano and ordered the cheese pizza. He said the crust was so unique and flaky that cheese is the only topping you really need and he was right! 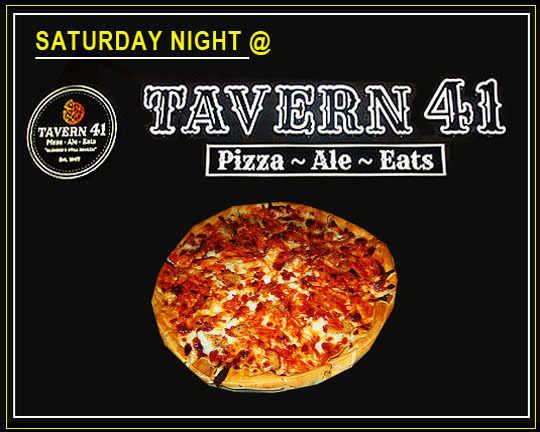 Chris told me that they are using his dad’s original recipe from 1967 and if you want to taste a delicious slice of Peoria’s pizza from the past, come over to Tavern 41! Four Galloping Gourmets—If you long for a taste of Peoria’s past, look no further than Tavern 41. They’re serving up pizza’s made from the original 1967 recipe along with sandwiches, chicken wings and delicious desserts! They also have a daily luncheon buffet. This place started in 1967 and it’s been reinvented in 2018, stop by and show some support to a new pizza parlor and tavern that’s been reborn and back to being locally owned! Related Posts: Saturday Night @ Lou’s Drive-In (In East Peoria), Casa Amigos Mexican Restaurant and Paparazzi.